about two months ago I noticed a small rivulet forming in the front sidewalk; this progressed until there was a small stream with lots of birds enjoying their bath. One day I saw six different kinds of birds there. 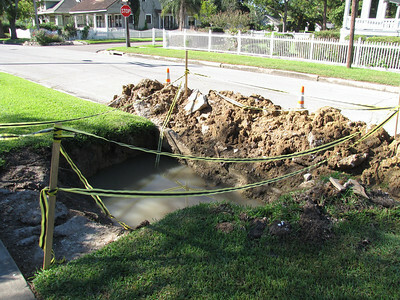 But then the city came by and dug it all up, replaced the broken water main and then we had a small lake. The neighbors used it as a trash can and I wondered how long it would be before they filled in the hole. So they arrived last week and filled it with sand–which all promptly washed out in the three days of rain that we’ve had. But the birds have taken one look at it and flew on to other spots.